NYM blogged about this cuirass previously here. Robert Gibbs, Closing of The Gates of Hougoumont, 1903, National War Museum, Edinburgh. 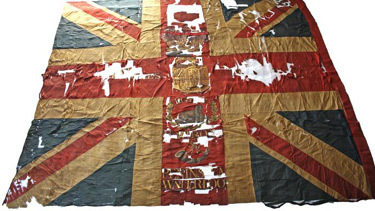 A battered regimental standard that survived some of the fiercest fighting at Waterloo is being painstakingly pieced together after being found in fragments in a cardboard box. 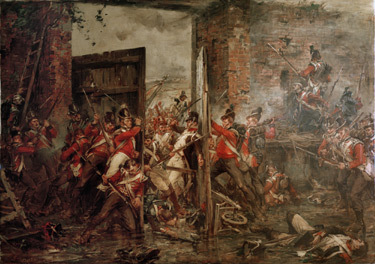 The colours of the 2nd Battalion, Coldstream Regiment of Foot Guards were flown at Hougoumont Farm, a key engagement in the battle at which Napoleon was defeated in 1815. The 6ft 5in by 5ft 7in silk flag is one of a handful to have survived. It turned up at auction in the United States, where it was bought for less than £500. The flag is being reconstructed by May Berkouwer, a textile restorer who works with the Victoria and Albert Museum and National Trust. When restored it could be worth hundreds of thousands of pounds. 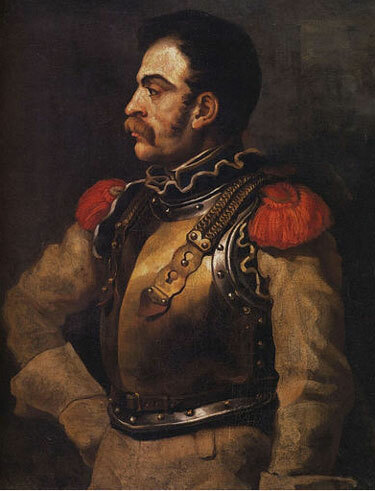 A]rchaeologist Dominique Bosquet of the Université libre de Bruxelles… found the soldier while excavating before construction near the battle monument known as the Lion’s Mound. … “I think this is a unique case,” he says. “We excavated 120 trenches in this area, covering more than half an acre, and found almost nothing and no other remains.”… Although the soldier’s head and one of his knees were destroyed by a bulldozer, and some of the bones of his hands and feet were damaged either by a plow—the area has long been a wheat field—or perhaps by a battlefield explosion that tore them away, the skeleton is remarkably intact. Bosquet is able to say that he was between 20 and 29 years old, about five feet three inches tall, with a slender frame. But, in some ways, the artifacts the archaeologist has recovered are able to tell even more of the soldier’s story than his remains can. At his hip, where his pocket would have been, Bosquet uncovered a spoon, a belt buckle, and 22 coins, as well as small pieces of fabric that probably belonged to the soldier’s uniform. Hoping it would have a mark that would enable him to identify the soldier’s regiment, Bosquet took X-rays of the spoon but, disappointingly, no such marks were visible. Bosquet holds out hope that the buckle, which is currently being conserved, may have some identifying marks. It was found near the soldier’s right leg and Bosquet suggests it could be from a belt used as a tourniquet to stop the bleeding from a battlefield wound, possibly the one that damaged his feet and hands. And among the coins, most of which are still awaiting cleaning and identification, there is a French half franc dating to 1811. “Perhaps in Belgium, English soldiers paid in French money in cabarets,” says Bosquet. “Or he may have stolen it from a dead French soldier’s pocket. 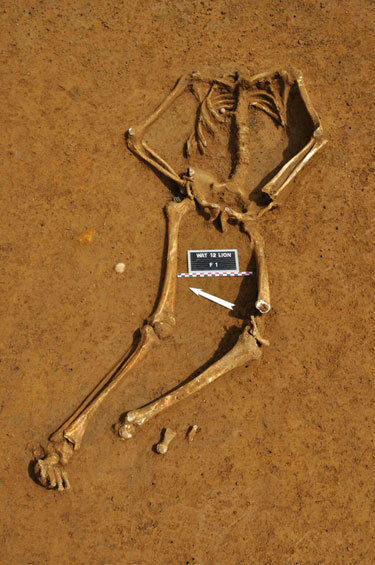 The archaeologist was able to identify the soldier as British not only by his position behind the British lines—in the chaos of the battlefield soldiers could easily find themselves on the wrong side—but by the musket ball still lodged in his rib cage. “According to its weight and diameter, the bullet is definitely French,” says Bosquet. Two flints the soldier carried in his pocket also mark him as a member of Wellington’s forces, as they are dark gray and of dimensions corresponding to the Brown Bess musket, the typical weapon of British troops. By contrast, the flints used to fire the French muskets were light yellow. Sometimes a soldier’s story ends with his death on the battlefield. But for Bosquet, there are still parts of this narrative that he hopes to finish. First and foremost he would like to know the soldier’s name. Next to the body the archaeologist found a piece of wood with the initials “C.B.” It is possible that the wood was part of the soldier’s gun, but Bosquet isn’t certain, and admits the initials could be those of another man to whom the object originally belonged. With the regimental insignia that Bosquet hoped to get from the spoon, or that may still come from the buckle, it may be possible to search for a “C.B.” among the British rolls. Without these pieces of evidence, giving the soldier a name is unlikely. But the absence of a name doesn’t make the story any less affecting. “After we uncovered him, I could almost see the guy dying before my eyes,” says Bosquet. “It was very touching and evocative of the cruelty of battle. For me, this was very hard.” Bosquet plans to contact the British embassy and army to ask whether they wish to give the remains a proper burial at Waterloo or have them returned to Britain for interment there. The archaeologist also wants to include the discovery in a new memorial at the site, ensuring that the soldier’s story, once told, will never be forgotten. Cuirass of Carabinier Antoine François Faveau worn in the Battle of Waterloo, 18 June 1815. The visitor to the Army Museum at Les Invalides, Paris, who walks into the room devoted to the 1815 Campaign and the Restoration is confronted by a dramatic relic taken from the battlefield of Waterloo. 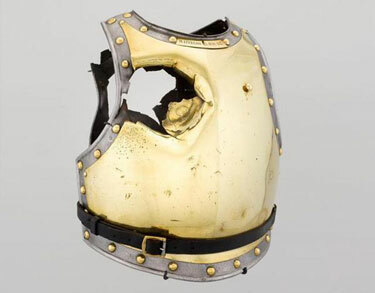 In a display caninet stands a handsome polished cuirass of brass-plated steel, expressing the martial glamour of Napoleon’s Army — except that a huge hole is punched through both breast and back plates, where a 6-pound cannonball smashed its way through the trooper’s right chest and shoulder. The sight of this ruined armour, now engraved with the date “18 juin 1815”, is extraordinarily moving, and the visitor cannot help imagining the fate of the 23-year-old Carabinier Antoine François Faveau, who wore it on that fatal Sunday. 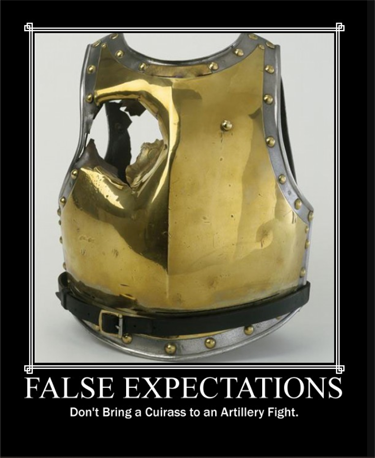 He rode with the 2nd Company, 4th Squadron, 2nd Regiment of Carabiniers — one of only two regiments to wear these gleaming brass-faced cuirasses. Brigaded together, these two regiments took part in the last desperate charge sent by Marshall Ney against the stubborn British infantry squares. [After 24 December 1809:] the uniform of the carabiniers: white costume, double steel cuirass (breastplate and backplate) covered with brass sheathing (copper for officers), helmet with a peak and which covered the back of the neck, with a golden-yellow copper crest decorated with a chenille made of scarlet bristle. Their armament included a carbine, a sabre (straight-bladed before c. 1811, then “a la Montmorency” – with a very slight curve) and a pair of pistols. Hat tip to ClassicPics (Twitter) via Karen L. Myers. The Duke of Wellington disposed his forces with his customary prudence and intelligence, and Fortune came to his aid. The British victory at Waterloo left England triumphant and serene, supreme in Europe for a century. Waterloo doomed, on the other hand, the hopes of France (and the rest of Europe) to achieve unity and pass from despotism into Modernity under the leadership of the hero of the age, who had cleansed the Revolution of its filth and covered it with glory. (Waterloo! Waterloo! Waterloo! Gloomy plain! Pale death mingled the dark battalions. On one side was Europe and on the other France. My Lithuanian ancestors fought on the side of France, hoping to achieve the restoration of the freedom and independence of Poland-Lithuania, partitioned and fully occupied by Russia, Prussia, and Austria in three stages: 1772, 1793, and 1795. Napoleon’s defeat condemned my ancestral homeland to occupation by Russian despotism for a century. Waterloo was a great battle and a great victory for Britain, but not for Europe. the Archives of Never Yet Melted in the 'Waterloo' Category.